TWO GOVERNMENT MINISTERS have insisted that talks with the European Central Bank (ECB) to reach a deal to reduce Ireland’s bank debt will continue despite a report that the ECB had ruled out a key Irish proposal. The Reuters news agency reported yesterday that the ECB had ruled out the prospect of Ireland issuing a long-term government bond as a replacement for the promissory notes given to the former Anglo Irish Bank, citing EU treaties. The government has spent months seeking a deal to write-down the cost of the promissory notes which as presently constituted will mean that the State pays €3.1 billion every year for the next ten years with the next payment due on 31 March. Communications Minister Pat Rabbitte told RTÉ Radio’s Marian Finucane programme, that there was “no basis” for the Reuters report and said that discussions were ongoing. “It is not the case that the discussions have concluded… the discussions are going on but I believe they will be concluded and they will be concluded before the 31 March,” he said. 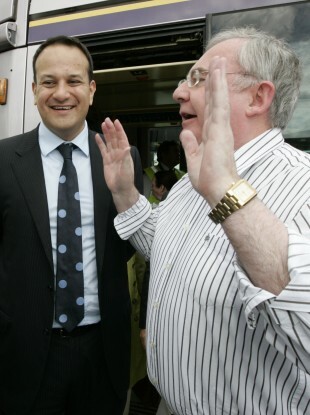 His government colleague, Transport Minister Leo Varadkar, acknowledged later on The Week in Politics on RTÉ television that there was no agreement reached as yet between Ireland and the ECB’s governing council. “They weren’t rejected, there was no breakdown but there certainly isn’t an agreement yet,” he said. Varadkar said there had been some issues that needed to be worked and said that government was still hopeful of a resolution that would mean Ireland avoided paying out €3.1 billion at the end of March. “There was no rejection, there was no breakdown [in talks with the ECB]. There are issues that need to be changed, and issues that need to be agreed on,” he told the programme. He said that the government should tell European partners that it will not pay the promissory notes – a move that many would view as being tantamount to a sovereign default. “This debt is Fianna Fáil’s legacy to the Irish people. It is not our debt. It is a hangover from the days of the golden circles,” the Louth TD said in a statement. Email “No agreement but bank debt deal talks will continue, Ministers insist ”. Feedback on “No agreement but bank debt deal talks will continue, Ministers insist ”.